Company name: YOUNG MUSIC & DANCE STUDIO PTE. LTD. THE wealthy widow fighting to retake control of her estimated $40 million assets has cut former China tour guide Yang Yin out of her will. Madam Chung Khin Chun, 87, has made a new will which leaves nearly all her fortune to charity. She has cancelled one made in 2010 in which Yang was set to inherit all her assets, including a $30 million bungalow off Yio Chu Kang Road. The new will, made last Saturday, came three weeks after the Family Court ruled that the widow was mentally capable of deciding who should take care of her finances and personal welfare. The court had allowed her to cancel a Lasting Power of Attorney (LPA) she granted Yang in 2012 which gave the former tour guide control over her assets. In the new will, seen by The Straits Times, Madam Chung stipulated that $500,000 be given to Madam Chang Phie Chin, whom she calls her "dear friend". The retired teacher, 84, has known Madam Chung for more than 50 years and lived with her in her bungalow from 2005 to 2011. Madam Chung's only sister Doris will get $500,000. The rest will go into setting up a charitable trust named the Dr Chou Sip King Trust, in honour of her late husband - a general practitioner who died in 2007. In the will, the widow appointed her niece, Madam Hedy Mok, a tour agency owner, to run the trust for 30 years and make annual donations to beneficiaries in four fields: education, children's charity, animal welfare and medical research. "He has no more interest in my aunt's assets," said Madam Mok of Yang, adding: "He gets nothing. If he wants to challenge the will, he has to go to court." Madam Mok added that her aunt's lawyer will be filing the new will in court soon. The Chinese national had met the widow in 2008 while acting as her private tour guide when she visited Beijing with Madam Chang. A year later, he moved into the widow's bungalow, claiming that she had adopted him as a grandson and asked him to look after her. He set up a music and dance school and obtained an Employment Pass in 2009. He obtained permanent residency in 2011 and brought his wife and two young children to Singapore last year as his dependants. The 40-year-old has since been arrested by police and charged in court. He faces 334 charges for allegedly lying to the Immigration and Checkpoints Authority and falsifying receipts made to his company, Young Music and Dance Studio. He has been denied bail and has remained behind bars since Oct 31. He is due back in court for a pre-trial conference on Thursday. Separately, Yang is also being sued by Madam Mok in the High Court for allegedly manipulating her aunt into handing over her assets. Madam Mok is seeking damages and trying to add his wife, parents and previous bailor as defendants in the suit. The suit will be heard today. SINGAPORE: Former China tour guide Yang Yin will not be entitled to any part of Madam Chung Khin Chun’s assets after the Court recognised a new will drawn up by the wealthy widow. The will was made in December last year, and it leaves most of her assets to charity, and nothing to Yang. It replaces an earlier will made in 2010, in which the 88-year-old had left her entire estate — estimated at S$40 million — to Yang. Mdm Chung had met Yang while on a trip to Beijing, where the latter acted as her private tour guide. A year later, Yang moved into Madam Chung’s Gerald Crescent bungalow with her. The widow’s niece, Madam Hedy Mok, later filed for legal action against Yang, accusing him of taking advantage of her aunt, who has since been diagnosed with dementia. Mdm Chung’s lawyer Peter Doriasamy told TODAY that the court had “acted in (her) best interest… in light of what we have found out about Yang Yin”. The new will was made under the Mental Capacity Act due to Mdm Chung’s condition, Mr Doriasamy said. He added that under the new will, Madam Chung’s fortune will go towards various charities after she dies. Yang’s lawyer Daniel Zhu said that he has applied for permission to meet with his client — who has been in remand since Oct 31 last year — sometime next week, to receive instructions on how to proceed. Separately, Yang is facing more than 300 charges in total, including two for criminal breach of trust, for allegedly misappropriating S$1.1 million of Madam Chung’s assets. He is accused of plotting to steal $40 million in cash and assets from a Singaporean widow. He has even been charged with duping the Government into granting him an employment pass and permanent residency. And while his name may have been splashed in the local media for almost two years, former China tour guide Yang Yin has not been seen in public for 19 months. He has spent that time in Changi Prison, after being arrested by the police in September 2014, charged a month later and denied bail. Tomorrow, the 42-year-old makes his first public appearance in almost two years. He goes on trial for falsification and immigration charges. The case involving Madam Chung Khin Chun, 89, and Yang broke in 2014, when the widow's niece, Madam Hedy Mok, started legal action against him for allegedly manipulating her aunt into handing over her assets. Madam Chung owns a bungalow in Gerald Crescent and her assets are estimated to be worth $40 million. The retired physiotherapist has no children. Her husband, Dr Chou Sip King, died in 2007. Yang acted as Madam Chung's private guide during a China trip in 2008. He had been introduced to the widow by Madam Chang Phie Chin, a retired teacher who is a family friend. A year later, he came to Singapore and moved into her bungalow, claiming that the widow wanted him to be her "grandson". He set up a company, Young Music and Dance Studio, and obtained an Employment Pass to work in Singapore. In 2011, he obtained permanent residency and later, moved his wife and two young children here as dependants. The family lived in Madam Chung's bungalow. Madam Chung was diagnosed with dementia in April 2014. After the diagnosis, Madam Mok applied to be her aunt's guardian under the Mental Capacity Act. But the tour agency owner found, to her shock, that Yang had already been granted Lasting Power of Attorney (LPA) in 2012. The legal document gave him full control over all the widow's assets. Madam Mok moved in on Yang on multiple fronts. In August 2014, she asked the court to stop Yang from disposing of assets belonging to him and the widow both here and overseas. The Mareva injunction was granted. She also spirited her aunt out of the bungalow. On Sept 2, 2014, she confronted Yang's wife, Madam Weng Yandan, and their then two-year-old son and six-year-old daughter, demanding that they leave the house. Yang was overseas at that time. To stop Yang from controlling her aunt's assets, Madam Mok applied to the court to have the LPA cancelled. The Family Justice Courts heard the case in November 2014 and ruled that Madam Chung was mentally capable of deciding who should look after her assets, and allowed her to cancel the LPA. It was Madam Mok's first legal victory. She also scored another victory in February this year when the Court of Appeal overturned an earlier High Court decision to release about $98,000 for Yang's legal fees. The High Court decision was made in April last year. In overturning the decision, Chief Justice Sundaresh Menon said that Yang had not explained his finances. The onus was on him to show that he had no other source of funds to pay his legal fees, said the Chief Justice. In April this year, Yang changed his lawyer to get "a new perspective". He is now represented by Mr Irving Choh, founder of law firm Optimus Chambers. Madam Mok is represented by Mr Peter Doraisamy from Selvam LLC. But while the question over the control of the assets while Madam Chung is still alive was resolved, a more troubling matter still hangs in the balance - who inherits the assets after the widow dies? In 2010, Madam Chung made a will in which Yang stood to inherit everything. To correct that, Madam Mok made a new statutory will on behalf of her aunt last year, in which most of the assets would go to charity. The courts recognised the new will in April last year, based on evidence given by several witnesses that Madam Chung had made the 2010 will under the undue influence of Yang, among other factors. Yang appealed on grounds that there was a procedural failure in the proceedings as the judge had denied his lawyers the chance to cross-examine witnesses who had given evidence to support the application for the new will. The appeal was dismissed last month but Yang can still appeal the decision. When Yang appears in court tomorrow, it starts a new phase of the family drama that has gripped the media for the past two years. But the alleged immigration and falsification offences that he will be tried for in court tomorrow are the less serious ones. 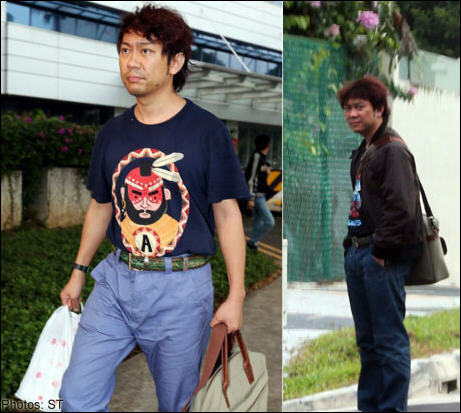 He also faces two criminal breach of trust (CBT) charges of allegedly siphoning off $1.1 million from Madam Chung. Tomorrow's trialcovers only the alleged immigration and receipt falsification offences. He is due back in court next month for the CBT charges that carry a jail term of up to seven years and a fine. But it is not yet known when his biggest showdown with Madam Mok will take place. Her high-profile civil law suit against Yang has not been scheduled to be heard in the High Court yet. Madam Chang Phie Chin introduces Yang Yin to Madam Chung Khin Chun and her husband, Dr Chou Sip King. Dr Chou dies in 2007. Yang acts as the private tour guide for Madam Chung and Madam Chang while they are on holiday in Beijing. Yang keeps in touch with Madam Chung after the trip. Yang visits Madam Chung and stays in her bungalow. He also sets up his company, Young Music and Dance Studio . In September, Yang fires Madam Chung's driver of 30 years. He obtains an Employment Pass to work in Singapore. Madam Chung makes a will leaving her assets, including the bungalow, to Yang. Madam Chang moves out of the Gerald Crescent bungalow. She had lived there since 2004, after Dr Chou's health deteriorated. Yang becomes a Singapore permanent resident. Yang is given Lasting Power of Attorney(LPA) by Madam Chung, giving him control over her welfare and assets. In 2013, his wife Weng Yandan and their two children move in to live in the Gerald Crescent bungalow. In April, Madam Chung is diagnosed with dementia. The LPA is revoked in November after Madam Chung's niece, Madam Hedy Mok, starts court proceedings against Yang. Yang is arrested in September and charged in October. He is later denied bail. Madam Chung's new will is recognised by the Family Justice Courts in April. Her new will leaves most of her assets to charity and nothing for the former tour guide. The High Court dismisses the appeal made by Yang in April this year regarding the new will. The criminal trials are scheduled to take place from May to July. The woman at the heart of the saga is 89-year-old widow Chung Khin Chun, who was diagnosed with dementia in 2014. Her assets, which include a Gerald Crescent bungalow off Yio Chu Kang Road, are estimated to be worth $40 million. The 42-year-old former tour guide is being accused of manipulating the elderly widow into handing over her assets. In a 2010 will, Yang Yin stood to inherit all of Madam Chung's assets. But a new will recognised by the courts will leave most of her assets to charity, and nothing to Yang. His wife and parents are also defendants in the civil suit. The case unfolded in 2014 after the niece of the wealthy widow, Madam Hedy Mok, a 62-year-old tour agency owner, commenced a series of legal actions against Yang. The retired teacher has known Madam Chung and her late husband, Dr Chou Sip King, for more than 50 years. Madam Chang Phie Chin, who is now 86, lived with the couple in their Gerald Crescent bungalow after Dr Chou's health deteriorated. She moved out in 2011. The lawyer from Selvam LLC represents Madam Mok in the High Court civil suit. MR IRVING CHOH The lawyer took over the civil case for Yang Yin from Mr Joseph Liow in April. He is the founder of law firm Optimus Chambers. He acts for Yang in the criminal matters. Art expert rubbishes ex-tour guide's claims about cost of works he had bought for Madam Chung. A painting which Yang Yin claimed he had bought for $500,000 was dismissed by an art expert yesterday as nothing more than a cheap fake that would have cost $200 in a night market. Madam Lim Sew Yong, chairman of Raffles Fine Arts Auctioneers, also rubbished a set of five other paintings the former tour guide from China said he had bought on behalf of a widow for $600,000. Madam Lim valued them at $2,000 to $3,000 altogether, and told the court that it would be "stupid" for anyone to pay much more. Madam Lim was taking the stand on the third day of Yang's trial, in which the 42-year-old is fighting charges that he dishonestly misappropriated $1.1 million from Madam Chung Khin Chun, a wealthy widow he met in 2008, and a year later moved into her Gerald Crescent bungalow. He claims that he used the money to buy paintings for Madam Chung, a known art lover. But yesterday, as he stared on impassively, the court heard that the paintings were worth far less. The prosecution called on Madam Lim, who set up Raffles Fine Arts Auctioneers in 1992. She had been asked to look into the paintings bought by Yang Yin. 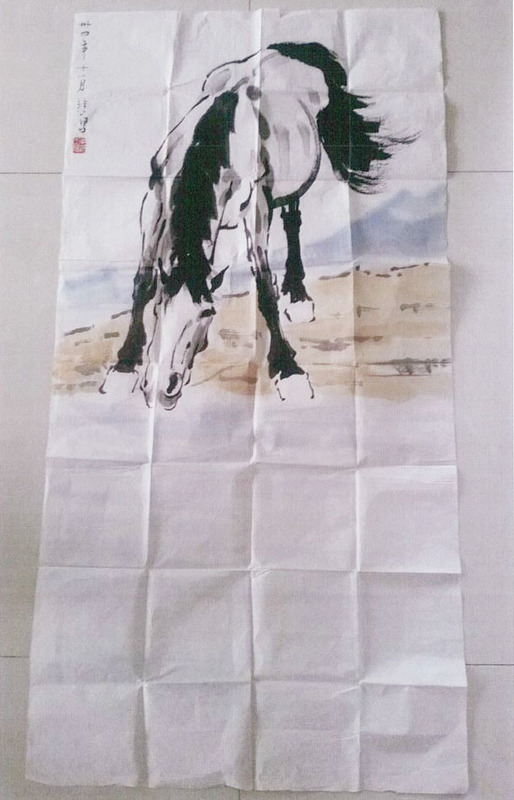 One was titled Horse Drinking Water, which Yang claimed was by renowned Chinese artist Xu Beihong and cost $500,000. It had been folded several times and stuffed into an envelope, which was found in Yang's luggage during a police search. Madam Lim said it was an imitation based on two original works by the artist. "If this were to be sold in the pasar malam, China night market, it would be worth about 1,000 yuan - equivalent to $200," she said. Madam Lim said she knew the artist's wife, who told her that the original paintings were done on double-layered paper. The painting Yang had was not, and it also appeared "relatively new". Deputy Public Prosecutor Sanjiv Vaswani asked if an original would have been "folded up like a roti prata?". Madam Lim said no, adding it should have at least been rolled up and kept in a box. "As a collector I would not treat the painting in this manner." As for the other pieces, Madam Lim said they were neither masterpieces nor coveted by high-paying collectors. Two were original while the others - including one of a woman lying on a couch, were either lithographs copied by machines or of "not very high quality". Yang's lawyer Irving Choh argued, however, that value of art is not a science and it is up to the buyer to decide how much he is prepared to pay. In the market, it is "willing buyer, willing seller". Mr Choh also highlighted the testimony of Mr David Fu, director of auction house 33 Auction, who said the painting of the woman lying on the couch was bought by Yang for $8,960 at an auction in 2011. But when DPP Vaswani asked Madam Lim if she would believe anyone claiming to have bought the paintings for $600,000, outside of an auction, she said no. And if someone did, "that person would be stupid". Also taking the stand yesterday was Madam Chung's relationship manager at OCBC for the period 2009 to 2010. Mr Huang Yi Yao, 34, told the court how the widow, now 89, had asked, in August 2009, for Yang to be made a joint holder of her accounts. He said Madam Chung did this because she was getting old, and wanted someone to help run her financial affairs. That did not mean Yang had any share in the money, he added. "The accused can only operate the account as Madam Chung sees fit," said Mr Huang. Her accounts included unit trust investments, which were "substantial", he explained. He told the court that as he went through the investments with Madam Chung and Yang, he noticed how the latter seemed interested in them. He "leaned forward", recalled Mr Huang, and he "opened his eyes bigger". SINGAPORE: Former tour guide Yang Yin’s “criminal odyssey” lasted for the five years - the entirety of his stay in Singapore - during which he committed crimes against wealthy widow Chung Khin Chun, Government agencies and multiple individuals and businesses, prosecutors said on Wednesday (Sep 28). Aside from the 10 to 12-year jail term they have sought for Yang’s misappropriation of S$1.1 million from Mdm Chung, prosecutors urged the court to impose another two-and-a-half to three years’ jail on Yang, following his conviction in May of 120 charges. These charges include 110 counts for falsifying receipts involving S$186,900 showing payments to a shell company Yang set up to gain permanent residency here, as well as four charges under the Companies Act and three each for cheating and immigration offences. The court heard Yang had fooled five Government agencies – including the Accounting and Corporate Regulatory Authority, Inland Revenue Authority of Singapore, Central Provident Fund Board, Ministry of Manpower and the Immigration & Checkpoints Authority – on his way to obtaining permanent residency here. Yang registered a sham business – a music and dance school – and duped MOM into granting him an Employment Pass, which he later used to shore up his permanent residency application to the ICA. He also tricked IRAS and CPF by paying small sums of income tax – which he later called “charity” and “giving back to society” – to reflect his employment at a seemingly profitable company, prosecutors said. “This is the character of Yang’s stay in Singapore. Although this epic tale is nearly at its conclusion, in this final chapter we still see a lack of genuine remorse … I’m hard-pressed to find even a single indication of compunction, of regret, for what he has done,” DPP Tan said. Defence lawyer Irving Choh urged the court to impose a shorter jail term of one to two years, citing hardship on Yang’s family. “My client has a wife, two young children and aged parents to support”, Mr Choh said, adding Yang had been the sole breadwinner of the family and that his parents are not in good health. Yang will be sentenced on Thursday morning. Yang also faces two charges for criminal breach of trust, for which he will be sentenced separately on Friday. Yang pocketed S$1.1 million from Madam Chung during his stay here, in what prosecutors called a “deep betrayal” of the widow, 89, who had given Yang control over her assets – worth millions of dollars – trusting him to use the money to look after her in her golden years. Instead, in the years that followed, Yang nearly emptied the widow’s bank account. In early 2010, Mdm Chung had S$2.7 million in liquid assets. By August 2014, shortly before Yang’s arrest, the widow’s bank account contained less than S$10,000. She was none the wiser. Yang had “intentionally fostered an environment of unquestioning trust with Mdm Chung … by capitalising on her age and lack of familial support”, DPP Sanjiv Vaswani told the court at a hearing earlier this month. To date, the true whereabouts of the S$1.1 million remain unknown. Yang has not made any restitution. Another S$1,128,004 remains frozen in his bank account. According to Yang, Mdm Chung, whom he met in 2006, had convinced him to leave his wife and two children and move to Singapore to live with her in her Gerald Crescent bungalow as her "grandson". He moved here in 2009, and by February 2010, Mdm Chung had made a will leaving all her assets to him. When Mdm Chung was diagnosed with dementia in 2014, her niece Hedy Mok stepped in and took Yang to court. Yang was subsequently arrested and charged. SINGAPORE — Former tour guide Yang Yin was sentenced to 26 months’ jail on Thursday (Sep 29) for falsifying receipts, as well as for his immigration and cheating offences. The sentence was backdated to Oct 31, 2014, the day Yang was remanded. The 42-year-old Chinese national — who has been embroiled in a long-standing legal tussle over the 89-year-old Madam Chung Khin Chun assets — was convicted of 120 charges in May. Of these, 110 charges were for falsifying receipts made to his music-and-dance school to gain permanent residency here, while the others were for immigration and cheating offences, as well as breaches of the Companies Act. An additional 227 charges will be taken into consideration for the sentencing. In meting out the sentence, deputy presiding judge Jennifer Marie said the court accepts that Yang’s offences were “without a doubt premediated and carefully planned”. He had deceived not only the various public institutions but also the accountant he had retained to help him prepare the accounts for his school. These offences were also committed over an extended period of time, she added. In mitigation, lawyer Irving Choh had argued on Wednesday that Yang should be considered a first-time offender. But Ms Marie noted that given that his offences took place over a protracted period of time, there was “little merit” to treat him as a first-time offender. And on the hardships that Yang’s family would face as a result of his punishment, the judge added that that will be a “natural result of the accused committing an offence”. “Ultimately, the accused and, regrettably, his family will have to face the consequences of disruptions to his family life owing to the due process of law,” she added. When determining the specific sentences for the various offences, the judge noted that Yang’s falsification, cheating and companies offences “all play important supporting but complementary roles” to ensure the successful execution of the immigration offences. In this case, she added, there were sufficient aggravating factors to scale the sentences for the immigration offences upwards to reflect the “high degree of premeditation and planning” over several years. On his falsification charges, Ms Marie said that while Yang had devised a very elaborate plan of falsifying receipts to create the impression that the school he set up was profitable and paid him well enough to apply for PR, there was also no evidence to show that these offences had engendered any risk to investors or creditors. Last month, Yang also pleaded guilty to two counts of criminal breach of trust for misappropriating S$1.1 million from Mdm Chung. He is expected to be sentenced on Friday for this particular set of charges. SINGAPORE - Yang Yin, the former tour guide who was convicted of cheating a rich Singaporean widow of $1.1 million, is no longer a Singapore permanent resident (PR). The Immigration and Checkpoints Authority (ICA) revoked his PR status after he was sentenced in September last year to a six-year jail term for criminal breach of trust. Confirming the revocation, the ICA told The Straits Times: "Any Permanent Resident (PR) who has been convicted of an offence will have their PR status reviewed by the Immigration and Checkpoints Authority. Yang Yin's PR status was revoked on 1 November 2016." The ICA had previously said that individuals who provide false information in their application for immigration facilities will be dealt with firmly under the law. Besides being convicted of cheating Madam Chung Khin Chun, 90, Yang was also jailed for two years and two months in Sept last year for a slew of crimes regarding his immigration status, including falsifying receipts for a sham company in order to stay in Singapore. The 42-year-old Chinese national is serving the sentences consecutively. Yang had preyed on the vulnerability of Madam Chung, said Principal District Judge Bala Reddy. The prosecution has filed an appeal against the six-year jail sentence given to Yang Yin (centre) for criminal breach of trust. When the case first broke in 2014, questions had been raised about how the former tour guide had been granted permanent residency here. He was found and convicted by the court to have lied to the ICA that he was running a profitable business and earning a salary via his sham company Young Music and Dance Studio, so it would grant him PR status, and his wife, a long-term visit pass. In August 2012, the law was amended to make it administratively easier for the ICA to revoke the foreigners' permanent residency. Then, Mr S Iswaran, who was Second Minister for Home Affairs, said that while the vast majority of Singapore PRs do not pose any threat to Singapore's law and order, the amendment would send out a clear message that PRs must respect and abide by Singapore's laws. Though Yang faces a total of eight years and two months in jail, there is a chance that he will remain in jail longer because of the prosecution has appealed the sentence. The appeal was scheduled to be heard in the High Court on Friday (Feb 17) but was postponed. The new date has not been fixed. Besides the criminal cases, Yang has also been sued by the widow's niece, Madam Hedy Mok, for allegedly manipulating the elderly woman into handing over her assets worth an estimated $40 million. The civil case is still ongoing.